Halloween 1983. Ducks in a row, from left to right: Micah, Erin, Val (my sister), me. 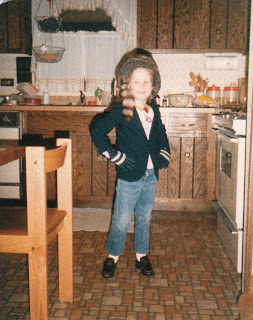 Now, my question for you (and you don't get to answer this, Mom): What was I dressed up as? I bet you won't guess it, since I don't think I look like what I'm supposed to be. Same question for this picture: What the hell am I supposed to be, here!?! My dad titled this picture, "Daniel Crockett." I say the kid in this picture looks like a grade-A hammerhead. Man, could I strike a pose, though! This is my neighbor, Micah, and me. 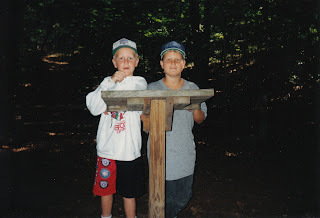 We're at Camp Roger in Dutch-country, Michigan. Or, if you're familiar with the state, anywhere in Michigan. All-star catcher for the Mets. I'm pretty sure the fact that I was a Met broke my dad's heart. He still talks about the '69 season. If you're familiar with the Cubs' storied past, you know all about it. If you're not aware, the Cubs barely beat the Mets to win the East. Then they went on to win their 28th World Series Championship. 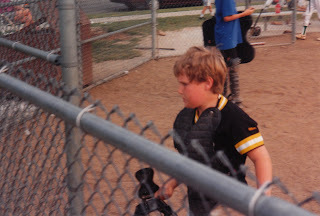 Anyway, this was my last season playing for Briarcliffe baseball. I missed one game that year (for a church related event) and got yelled at by the coach because we lost. Thus proving, religion destroys everyone's dreams. This is me standing behind mine and my dad's birthday cake (we were born on the same day). I'm sporting a Mickey Mouse helicopter hat because, as evidenced in previous photos, I have what is commonly referred to as "a wicked fashion sense." Take that however you like. If you look closely at my right cheek (my wicked side), you'll notice a series of scabs. I acquired these by riding my bike into a tree...less than 48 hours before class picture day. Needless to say, I ended up going to picture retake day that year. Now I'm going to cry myself to sleep. Are you some sort of space man in that first picture? Some sort of space man clown, maybe? And are you wearing a cowboys hat in that one picture of you and your neighbor boy? So many questions. But these pictures answer so many other questions. Picture 1 you were He-man. I know that because I was he-man in half my childhood halloweens. Picture 2 confuses me, though. At first I thought it was Davy Crockett, but that's not the case. I think you were trying to look fancy, rich man -- like a man who wears a coat with fur on it and beautiful leather gloves. Very metro. OK, in my defense, I do not take any responsibility for how you are dressed in those pictures since you had your own ideas about how to dress and there was no arguing with you. Are you sure that wasn't Halloween 1984 right after Lara was born and I didn't have time to be more creative? You were a great baseball player, the best catcher on the team. Too bad you quit. Oh, and just so everyone knows, my kitchen has been remodeled. 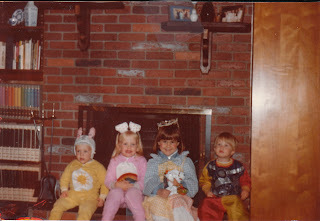 Back of the picture says Halloween 1983, Ma. I kept staring at the background in those two pictures taken in the kitchen. It's been worked on several times since then. For the Halloween picture, I am going to guess Optimus Prime cause it just feels right. And poor Micah, is he a Care Bear? In the Davey Crockett picture are you wearing Irene's Isotoner gloves? Cause that really throws me off. 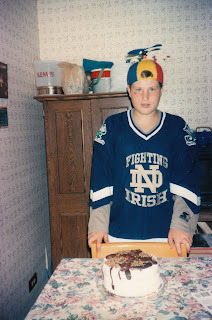 And in the picture behind the birthday cake, is it just me or is the kitchen angling down toward the left a little? I'm going with Heman for that first one. I think it's the gold-red combo that's Heman-esque. But, dude, your toddler self totally needed more muscles. I was a clown in the first picture. And yeah, I was going to guess a robot clown... but I thought Optimus Prime felt pretty good myself.